@Riri wrote: Lmao honestly, it bothers me that magazine authors can't get Ben's characterisation right. Them and the author of the junior novel and basically 95% of everyone else in the world. It's all so tedious. It's gonna be a long haul to IX, isn't it? I find it extremely discouraging because there's so many of them and sometimes it makes me feel like I'm wrong because I'm in the minority. I'm really so glad this forum exists. Seriously. I've had to really limit the other SW content that I read, watch, or listen to, or basically get anywhere in the vicinity of. Naysayers tend to be louder than everyone else, sadly. I don't go anywhere but here, and a few selected Reddit threads that are Reylo-friendly. It would be one thing if we were totally wrong about TLJ, but we weren't. We were the most "right" of any contingent in the fandom. After TLJ, all that old headcanon nonsense really is just noise to me and not worth looking at, IMO. I hate when people call Kylo "emo". He wasn't emo in TFA and he wasn't emo in TLJ. Didn't Adam asked in one of his interviews what emo is? Or was that just rumor? 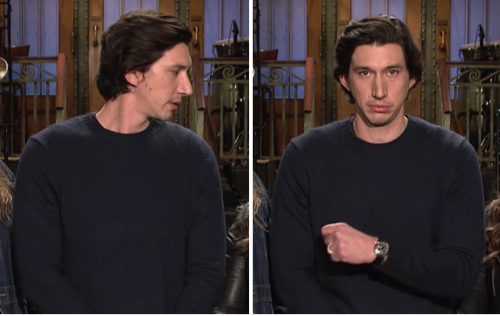 Adam Driver has a question for me. "What," he asks, "is emo?" Between training for the Marines and training at Juilliard to become one of his generation's most extraordinary actors, Driver missed some stuff, including entire music genres. But the rest of the world (including an amusing parody Twitter account) decided there's something distinctly emo about his character, with his luxuriant hair, black outfits and periodic temper tantrums. "You have someone who's being told that he's special his whole life," Driver says of his character, "and he can feel it. And he feels everything probably more intensely than the people around him, you know?" @ZioRen wrote: Why are people so determined to think Kylo was manipulating Rey when the movie spelled out in various ways that he wasn't? It's literally their headcanon with no canon support or basis that they're writing out as canon and it's baffling to me. Because Kylo having genuine feelings towards Rey doesn't fit their headcanon and has implications they'd rather ignore. I don't know if it's been asked, but with Kylo now as Supreme Leader, how/where do you envision he'll end up once IX finishes? What role will he have in the galaxy? What position will he be in? @rawpowah wrote: I don't know if it's been asked, but with Kylo now as Supreme Leader, how/where do you envision he'll end up once IX finishes? either dead (I really really hope not) or in some kind of exile. I'm not sure why, but I have the feeling Ben never wanted to be a Jedi, or any kind of political/leader figure. If he would've grown-up as a normal child, without force powers and his legacy etc. I think he would've become a nice, but awkward, nerdy type of guy who liked flying and reading. More an quiet introvert. So I hope he will get a normal as possible life at the end of IX. @Night Huntress Do you envision Rey in this exile with him? @rawpowah wrote: I don't know if it's been asked, but with Kylo now as Supreme Leader, how/where do you envision he'll end up once IX finishes? What role will he have in the galaxy? What position will he be in? He'll be in exile or somewhere with Rey. He probably won't be, and most certainly should not be, in any position of galactic power. But I'm the opposite of @Night Huntress in that I hope he doesn't have a normal life at the end of IX. I really want Kylo to have a lot more stories to tell post-IX. I want to see him experience what it really means to actually live through a redemption arc, which means difficult encounters with those in the galaxy he's wronged and potentially a sort of target on his back forever. Basically, somewhat angsty but also awesome and sort of romantic Kylo adventures with Rey. I'd love to see them Indiana Jones it across the galaxy so Kylo can nerd out over Force artifacts. @rawpowah wrote: @Night Huntress Do you envision Rey in this exile with him? I mean a normal civilian life on a nice not too industrial planet where the locals didn't know his identity or who he really is (or simply don't care). Oh, I wouldn't rule that out either. My headcanon is that he is faking his dead...or letting everyone believe he is dead after some big event in IX where it's unclear if he survived. Running of with Rey and living a normal as possible life at first but in constant danger of being discovered. Whatever he did in IX will divide the galaxy. Some will see him as the one who helped freeing the galaxy from the FO but others still seeing him as the big bad who needs to die for his crimes. I know it's not exactly the same but that would be a parallel to Obi-Wan (Ben ) Kenobi. I don't want him to have the Luke type of exile, and I can't imagine Rey in that situation either. She'd have to abandon her friends and I don't see Lucasfilm aiming for that (or at least I hope they won't). I'd be perfectly fine with a Katniss and Peeta type of ending (settling in a place away from all the political and industrial hubbub and raising their own family, keeping in touch with their friends). I hope I'm not being too naive or optimistic about that? Am I? There seems to be such an emphasis in fandom (even those who like Kylo) about punishment and the Hosnian System and I don't know what to say. If Reylo is indeed endgame, my dream scenario is him and Rey having a belonging they need and living ordinary life since they’ve been through so much extraordinary stuff happening to them. I’ve seen people mention they want them to rule the galaxy, or become important politicians in even newer republic, or - most often of these - set up a Jedi school (which is my nightmare scenario ). This doesn’t mean I don’t want them to use the force or have Kylo teach Rey what he knows - on the contrary - and I don’t mind people learning they’re force users and coming to them for advice upon discovering their own powers - just no organised Jedi school with curriculum etc. please. From what we know, Rey always knew there’s something inside her but she only started to care once it’s awakened - and not even then, actually, but once she’s become involved in the galactic conflict herself (which kinda happened at the time of her awakening ). Rey admired the Resistance but never thought of joining them and her family was more important for her. With Kylo, we don’t know for sure how he felt about joining Luke’s academy but Ben felt rejected by his parents then so he likely wasn’t particularly excited about his very special powers. Kylo also joined the First Order more of personal reasons than some political ideology he believed in. And it seems he really just wanted to be a pilot like his father. So I think that both Rey’s and Kylo’s ideas of a happy and fulfilling life are actually the same and concentrate on having a family and belonging first and foremost. Showing them as politicians or Jedi teachers ( ) would distract the audience and shift their attention towards Rey and Kylo finding their purpose and happiness in whatever they’d do for a living rather than in each other. Having said that, this is all my personal wish for IX (my perfect ending is them flying off in the Falcon or looking at binary sunset with the Falcon parked nearby - cheesy, but I really want Kylo to have this ship ). Once proper marketing for IX starts and we get more information, I’ll probably start making my own guesses and bets. My idea of a Kylo "exile" was always more of a ronin-style thing anyways. Which is mostly because I want to read about a lot more Kylo adventures in the future, as I said. I'm in no hurry for Rey or Kylo to settle down into any sort of normality! I do think, however, that Rey will probably pass on the Jedi ways to someone eventually. I think it's clear that Lucasfilm doesn't want the Jedi to fully end, just to continue on in a new way. Which still means it has to, you know, continue. Rey's the only one left to do that. I actually think that based on Luke's words "I will not be the last Jedi" that Kylo will also be one to pass on information. But I really don't want a Jedi kindergarten for either of them, and I don't necessarily want a formalized Jedi either. The new canon has shown a variety of force users or force students who do not follow Jedi ways and actually seem to be pretty healthy people. To me Chirrut is the standard of force-centeredness, not Yoda. I like the ronin/adventure idea very much, even if kids are eventually involved. If they build a new extended family of friends, their own clan or entourage of sorts, the kids never really need to be left behind if they travel around to various places. I also think that this ties in well with the idea of Rey and Kylo going around and helping Jakku-type planets. I always see Ben as a healer in those situations and Rey as the tech/builder person. I am not against Kylo and Rey having force students at some point, but I think that they need to be like 16 at the youngest. I also think of Ben playing a secondary, special counselor kind of role in this, or how universities started in Medieval Europe with people who wanted to learn coming to a learned master like Peter Abelard. If he is to be pure teacher, I love my geeky Outer-Rim Harvard professor of history, ancient languages and Galaxy spirituality. That takes him out of the Jedi realm, but he is still passing on knowledge, to every kind of student, not just force users. If I recall, wasn't there a line in The Last Shot indicating that Baby Ben would probably want to grow up to be a pilot like his father, or something? I know I didn't just imagine that. about how Lando will always be a scoundrel, but that he's realized that he wants to be her scoundrel. I'm really hoping that line ends up as Reylo foreshadowing. As far as how IX ends, I think that @IoJovi probably has it right... They ended the first two movies with Rey looking back at Ben from Falcon; they'll end IX with Ben joining Rey on the Falcon, presumably to go off to their next adventure. I don't know that they'll get more specific than that. I do really hope that we get a fast-forwarded epilogue, though, showing them having the normal, loving family life with each other that they never had a chance to experience previously. Something that occurred to me recently with the eye-rolling over the fandom conspiracy theory du jour, Rey becoming a Jedi Kindergarten teacher to Broom Boi and a flock of adorable lisping moppets, is that fans need to pay a little more close attention to Luke's conversion from hero/Jedi Master to "anybody can have the Force." Which is both a meta-commentary on the PT, as well as an allegory for the "every man a minister" principle from Protestant Christianity (and Rian has spoken extensively prior to TLJ about how his religious upbringing has influenced his writing). Rey at the end of IX will likely be somebody who is passing on what she's learned to other Force users, to echo Yoda's words. However but she won't be the only Force user out there to teaching others how to understand/use it. Luke and Ben's respective speeches to her are about how the old way was to see the Force as the sole provenance of a special elite. One that had singled out and elevated their family but also damaged 3 generations in the process by separating children from their parents. They even manage to get a line in the novelization from Leia's PoV that Luke already felt that the rule about not having attachments was the primary reason for the destruction caused by their parent's relationship because it couldn't be open. So any type of world at the end and after IX, there will be teachers. But it's not going to be Rey's Special School for Gifted Children, same way the Resistance in IX will likely be an underground movement instead of being the cool group of special chosen people. In all of this, there's an underlying message that being a fan of the franchise/fictional universe isn't being part of a specific special group of people and that being a fan is however you chose to engage/enjoy it. Which at the moment, also a message sailing over the heads of a a lot of fans who interpret that to mean, anybody can be the exact type of fan I am. If they gonna start some kind of "Jedi-School" (for lack of a better term)- I don't want it to be like the old monkish Jedi Order with Padawan's and BLAH. I liked the old EU Jedi Praxeum- it was really more like a free-style school. I guess it's because those books were written before the prequels so the authors didn't know about the whole "rules" with no attachment or taking infants from their family etc. I picture something like the School for gifted in X-men. The scenario I had in my head even before TLJ is something like this: at the end of the war, Rey tells everyone that Kylo Ren is dead, and she and Kylo part ways doing their own thing. Then we cut to maybe two years later and finish the story on an emotional reunion, without necessarily spelling out their future living arrangements. Would that be too similar to the ending for The Dark Knight Rises, though? In a way, but I think that the details are different enough, i.e. Kylo is not the main protagonist like Bruce is and there's no attempt to play "is he dead or not" with the audience. I probably should have mentioned, the audience would know that Kylo is not dead. 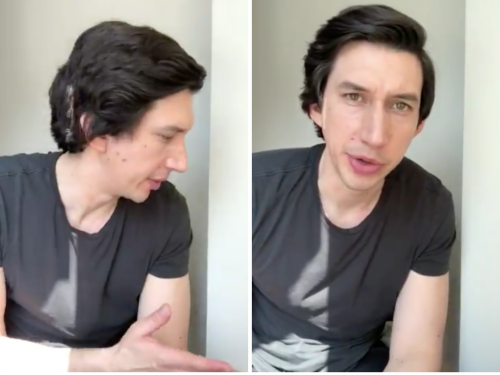 For anyone worried about short-haired Kylo in IX based on the latest we've seen of Adam: Don't be. This Tumblr user just spelled it out nice and clear.